Much of military-themed contemporary non-fiction targets the horrors and chaos and policies of war, or dwells in the psychological mine fields of coming home, or blows up real heroes into caricatures of themselves. 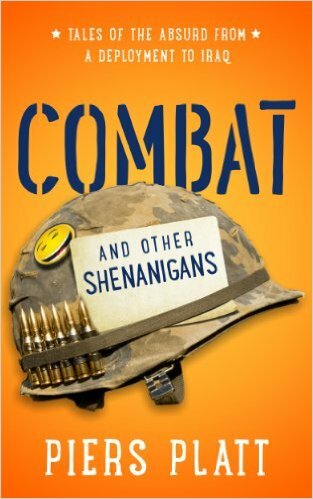 In his Iraq War memoir "Combat and Other Shenanigans," however, former U.S. Army Armor officer Piers Platt delivers a light-hearted but heartfelt depiction of what it means to go to war with your friends. To pile onto Maj. Gen. William Tecumseh Sherman's well-known quote: War may be hell, but it can also be fun. Seriously. I say this as a comedy geek, an enthusiast of modern military memoirs, and a fellow veteran: This book made me laugh out loud. Repeatedly. (And, of course, it also validates Sherpatude No. 26). Platt's writing style is conversational, affable, and fresh. Civilians with little familiarity with the military will easily understand his breezy explanations of, say, arcane military procedures and unit configurations. Veterans, however, will appreciate the skill with which he describes old traditions and pranks, such as dispatching privates to search for soft spots in tank armor, or for cans of radio squelch. Even if you think you've heard it all before (and you haven't), you'll still be entertained. At one point, Nicholls and I were running a range together, he as Range Safety Officer, and me as Range Officer in Charge. Out of the squadron’s nearly 30 tanks, just one final tank was left on the range, preparing for its gunnery qualification run. But we were about two minutes away from "dry time" in the afternoon, when the range had to be shut down, and there was no way this tank was going to finish in time. In addition, our medics (who by regulation need to be present every time a tank main gun is fired), had orders to move elsewhere as soon as dry time rolled around. Nicholls was pissed. "Switch out with me, sir." "What? Switch out as Range Officer? Why?" "Because I’m about to get decertified." It was too deliciously bad to refuse. We switched out (calling it in to Range Control, who maintains a log of who is in what position on which range), meaning that technically, he was now both the Range Officer in Charge and the Range Safety Officer, which was illegal. It wouldn’t take Range Control long to realize that administrative violation, and more importantly, they would hear our last tank merrily blasting away during dry time from all the way across the training area. It all came down to whether or not that tank could get enough rounds off before someone from Range Control physically showed up—Nicholls had already turned down the volume on the Range Control radio so we wouldn’t hear their inevitable attempts to contact us. The race was on. Nicholls had made contact with a tank, alright—an ancient rusted Russian hulk which obviously had been used for target practice many times by the Iraqi tank unit that had been stationed at the base before we invaded. His exact report to the command center was: "Ramrod X-Ray, Bulldawg White 4. I have identified the tank. It is a T-54/55 with more holes in it than my underwear." Apparently failing to pick up on the sarcasm about the holes, the command post became fixated on the "T-54/55" part of Nicholls’ transmission. Nicholls was implying that he wasn’t sure the specific type, whether it was a Soviet T-54 or T- 55, which are nearly indistinguishable, especially after being shot at for years. Somehow, the command post missed that nuance, and came to believe that there were two tanks: a T-54 and a T-55. Apparently delirious at the prospect of reporting on the most significant combat action of the post-invasion period, they ordered him to engage the enemy tanks. "Trying to summarize my experiences is difficult, partly because there was nothing conclusive or absolute about Iraq. I’m almost ashamed of my time in Iraq, compared to the experience of other veterans in history—it wasn’t like the accounts I have read of Vietnam, or World War II, it wasn’t epic or particularly life changing or at all typical of the wars I had studied. I was attacked a number of times, had a handful of close brushes with death, and killed one unknown enemy from several hundred yards’ distance, but otherwise spent most of the tour bored and frustrated, and returned unscathed. That's not to generalize for all those who have served in Iraq—I know there are soldiers who wish their experience had been a lot less traumatic, many in my own unit. I am grateful for having avoided that, but I feel unfulfilled, like a minor-leaguer who never gets his at-bat in the big leagues. I've been there, and I've done that, but … not in the way I expected." Platt calls his 181-page book an "absurdist memoir," and, in e-mail newsletters to readers, worries that "I'm not sure a memoir about the stunts my soldiers and I pulled in Iraq is really a good way to get a feel for the kind of books you can expect from me in the future." His website offers a number of other non-fiction and fiction titles he's written, some of them also free for the sampling. A science fiction novel is coming soon. A Facebook page for his books is here.